I bought a copy of Mollie Makes on zinio as I couldn't wait for the hardcopy to hit the stands. A gorgeous crafty mag full of handmade goodness. Clever things to make, beautiful photos, lovely handmade interiors, interviews and lots of inspiration. Kind of Martha gone edgy. I love it. Sometimes we need to see it written in bold type. Just to get the message across. I just discovered you r blog...it is lovely. 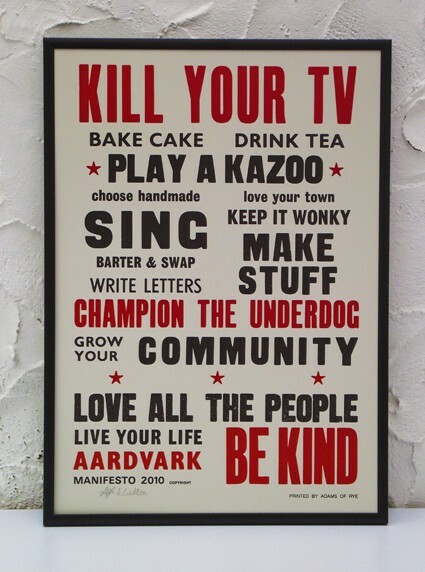 Oh, I love the manifesto too. It is so true of my philosophy.